Review of "For Individual Rights"
Most people are educated to some extent in the political practices of their government, its branches and laws, and know about some prominent past politicians. Few are conversant in political philosophy, however. This weakness can make them tools of authorities and dupes of propaganda. 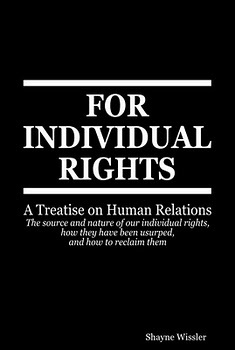 Shayne Wissler wants to remedy this with For Individual Rights: A Treatise on Human Relations. His book gives an explanation and theory of individual rights that can be understood by almost anyone. The book is largely a modern recapitulation of classical liberal political theory. Its strength is that it does so in a manner understandable to modern Americans. The book relies on (and includes quotes from) classical liberal luminaries like Thomas Paine, Sam Adams, Thomas Jefferson, Frederic Bastiat, as well as modern thinkers like Ayn Rand and Murray Rothbard. The result is a strong case for liberal anarchism, also known as anarcho-capitalism or market anarchism. The author would object to this characterization - using the word "anarchism" - but his consensual government with voluntary taxation is, to quote what Benjamin Tucker said about Auberon Herbert, "anarchist in everything but name." Every living organism acts in order to sustain its life. As a corollary, physical interference or credible threat of physical interference with the organism's life sustaining actions elicits self-defense actions against such imminent or actual interference, if the organism can muster it. This is a basic Law of Nature and applies to all organisms: Every organism acts in order to sustain its life; to act for its life is to act against interferences. Both action for and defense against are two perspectives on the same phenomenon. To pursue life is to quell interference with that pursuit. This is what I call the "Life Principle," the basis of rights and of proper human relations. The difference is that Auberon Herbert, like his mentor Herbert Spencer, justifies self-sovereignty in terms of faculties rather than biology: "Every individual, who lives within the sphere of his own rights, ... is the only one true owner of his own faculties, and his own property. ... Property is directly or indirectly the product of faculties, is inseparable from faculties, and therefore must rest on the same moral basis, and fall under the same moral law, as faculties." 1. The Law of Origin of Rights: Rights originate in individuals, and therefore nothing constrains them but the rights of other individuals. Every individual has the right to take any action that does not interfere with the rights of another individual. 2. The Law of Conservation of Rights: Rights originate in the individual and may neither be created nor destroyed, but only transferred to others through the individual's right of consent. 3. The Law of Origin of Government: Government originates in the consensual transfer of rights from individuals to representatives in order to enforce Natural Law and man-made laws; the man-made law jurisdiction of such a government is solely comprised of land owned by consenting individuals. Wissler writes, "Man has only one fundamental choice with respect to his interactions with other men: to respect their Life Principle or not. He can choose either to prey on other men to further his own survival, or not [but] to interfere is to invite attack, to rally the natural life processes of the victim into some form of retaliation." Again, this is very Randian in substance and style. But Wissler does have some original perspectives. For example, he defines a "right" as any action which is not a crime, i.e. which does not "interfere" with others' life principle. All human actions are rights or crimes. This formulation - defining rights as a list of actions - has its points, but has the drawback of neglecting the purpose of rights. However, he does explain that rights are not to be confused with morality. Wissler goes on to claim that rights are purely a "scientific-biological" issue. Students of political philosophy may find some flaws in Wissler's formulation. For example, the notion of "interference" on which he bases his theory is inadequate. One can interfere with another's life without violating rights in various ways: not hiring someone, successfully competing with someone in selling a product or getting a job, dating a person the other wanted, and so on. One gets the idea that Wissler is regressing to an earlier (19th century) less adequate formulation of rights. However, keeping in mind that this book is a tutorial for everyman rather than a academic treatise, this criticism is mild. After all, people ranging from Josiah Warren to John Stuart Mill used such a formulation. Also, many would deny that rights are purely "scientific-biological," especially as defined by Wissler as non-criminal actions. This is because the determination of "interference" depends at least partially on human convention. This is a drawback of his definition of "rights." Standard definitions of general moral rights ("moral claims to freedom of action" - Tara Smith, Moral Rights and Political Freedom) are higher level abstractions, and thus avoid this problem. Building on his definition of rights, Wissler next defines Natural Law as "nothing more or less than the definition of what actions constitute rights and what actions constitute crimes. It is the set of principles that human beings are obligated to follow by virtue of the fact that they are human beings, regardless of whether the man-made laws of governments exist or not." Expanding the traditional Lockean division of rights as "life, liberty, and property," Wissler divides rights into six fundamental areas: self, property, medium, land, consent, and justice. 1. Right to Self: The right to self is the right to move one's body as one desires, to reside unmolested by others in a given place, and to move from one unoccupied place to another. 2. Right to Property: The right to property is the right for human beings to pursue, acquire, and keep particular material objects, and to prevent others from using or taking those particular material objects. 3. Right to Medium (natural resources): The right to medium is the right to use portions of the natural flow of sunlight, water, air, and other natural mediums, as well as the right to defend one's continued use of such mediums after having incorporated its use into one's pattern of activities. 4. Right to Land: The right to land is the property right to the naturally-fixed portions of a given geographic area, as well as the medium right to the surrounding mediums that one's land use depends upon. 5. Right to Consent: The right to consent is the right to make agreements that yield a portion of one's own rights in exchange for a portion of another's. 6. Right to Justice: The right to justice is the right to take whatever action is required in order to force the initiator of a crime to make amends and assure he does not repeat his crime, so long as such action does not go beyond the bounds of what is required in order to do so. This is probably the most significant original idea in the book. Breaking down the Lockean trio is informative and instructive. Wissler has a good discussion of each of these. Breaking medium out from property seems a very good idea, even though media may become property through advancing technology, i.e. commons might be fenced (literally or figuratively) using technology. Wissler's right to justice would be improved by using the notion of proportionality rather than his dangerously fuzzy "assure he does not repeat his crime" but not "go beyond the bounds of what is required," but he gets the general idea across. Wissler describes the origin of government using a Robinson Crusoe model, or put another way, by a kind of Lockean consent process. What he describes is how a just, voluntary, "Natural Law" government could arise. He doesn't acknowledge that no known government actually arose that way, but he does stress that no existing government is consensual, nor do any fully respect Natural Law. "Such a government has only existed, at best, temporarily or on a small scale. No large-scale government today respects the right of consent of every individual. ... Such is not a proper form of government, it is an incessant state of war - not a clean war against a well-defined enemy, but a chaotic and oftentimes petty war of gang against gang, and gang against individual." After developing the idea of a just "Natural Law government," Wissler uses a very conventional model to illustrate it. Unlike the Tannahills, Rothbard, and most anarcho-capitalists who use the logical extreme of non-territorial legal jurisdictions, Wissler prefers to use a consensually created city-state as his model. He argues that property owners could voluntarily contract covenants concerning not only land use but also law. This would, in effect, create a city government. One might argue whether this is likely to occur. E.g. Would people really sell their right to rule their own land and be permanently subject to a city bureaucracy? Isn't such a permanent covenant a type of neo-feudalism, unless there is provision to change as the descendants of the original contractors choose? However, for the illustrative purpose of the book such a model seems reasonable. The more radical non-territorial PDA (private defense agency) model is certainly permitted in Wissler's notion of Natural Law government. He predicts that there would be, in a stateless society, a natural monopoly for law - an economy of scale - such that a city-state is optimal. Even many Rothbardians agree there may be economic advantages to some territoriality - though we see blocks or neighborhoods rather than a whole city as more likely to be optimal. Wissler defines "government" as "an association to which its members have consensually transferred a portion of their rights in order to more reliably defend the individual rights of its members than the members would otherwise be able to achieve individually, and for other purposes its members deem desirable. Such members are called ‘citizens' of the respective government." He adds that by the Law of Conservation of Rights "the new government is restricted to exercising only those rights that are voluntarily transferred - and no more." In the final part of the theoretical section of the book, he develops the idea of federalism in a manner reminiscent of Proudhon. He includes a list of functions the "higher level" governments might perform. "Such treaties result in a natural hierarchy of governments, with most rights concentrated with the individual, and successively fewer rights being aggregated toward the higher levels of government in order to accomplish successively more specific and limited purposes." His "foreign policy" is (as it is for all anarchists) panarchy. "Citizens of the government may have consented to a wide variety of abridgments (either themselves or by virtue of a previous land owner who transferred ownership with certain constraints). Everything ranging from a free market system to a kind of commune are legitimate. A system of social "safety nets" and a general property tax to pay for them are legitimate. So all the usual arguments people have about what kind of government they want become moot: if they don't like their current form, they would be free to alter it according to their previously agreed upon rules, or repatriate, or even strike out on their own in the vast unowned wilderness and make up their own laws. Such a system would result in a healthy competition between governments to discover the best sorts of laws that humans can create." Part II of the book starts with a critique of the State - "the crimes of totalitarianism." After general comments, he surveys the "fiats" characteristic of modern States: fiat jurisdiction and land ownership, fiat consent, fiat justice, fiat property (including intellectual property), fiat money, and fiat knowledge (government "education"). Part II continues with "refutations" - short commentaries on various subjects. This part is erratic. Some of the mini-essays are very good. The section called "Economism/Fascism" will have "left libertarians" cheering his list of "fascist tendencies" - examples of government favoritism for large/connected corporations. His comments about pragmatism, the Stockholm syndrome (I call it the Stateholm syndrome), and democracy are also good. Other sections are abysmal, such as his critique of anarchism written without knowing the definition. (He admits elsewhere that no actual anarchist defines it that way; he takes "anarchism" to mean what he thinks it should mean - a lame excuse for a straw man!) Some sections are part good and part bad, such as the section on minarchism. Discussing Ayn Rand's criticism of anarchism, he starts with a straw man, but goes on to a great synopsis of Roy Child's famous Open Letter. But then, unlike Childs who concludes that a consistent Objectivist must take the last logical step to anarchism in order to satisfy the NAP, Wissler makes the ludicrous claim that minarchists are "an even greater enemy of them [natural rights] than the worst kind of dictator." In some sections, he seems to misunderstand and deny propositions that are, in all but terminology, exactly what he asserts elsewhere in the book. For example, he ravages Rand for her definition of rights - "a moral principle defining and sanctioning a man's freedom in a social context." First he misunderstands "sanctioning," thinking it means permission by people rather than congruence to a principle, then he denies that a right is a moral concept even though he stakes his whole thesis on interference being immoral - that one should respect rights. One gets the impression that he wants to distance himself from Rand, which is ironic since his style of moral assertion (some would say intimidation) is so like Rand's. Part III of the book is a short section entitled "What to Do." Here Wissler diverges from Voluntaryism - he encourages electoral activism. In addition, he wants people to "preserve, protect, and defend the Bill of Rights," and suggests that you "be a practical idealist." He thinks that the USEmpire can be reformed into a Natural Rights federal government subject to local city-states and (presumably) PDAs. My impression is that he is rather oblivious to the institutional properties of a State, and the fact that such reform is all but impossible - vanishingly unlikely. He's a philosophical anarchist who lacks an institutional analysis of the State. Without such an analysis, he naively sees a stateless society as pretty much like the statist quo, but with power magically shifted from central State to municipalities - from top-down to bottom up. On the whole, For Individual Rights is pretty good. The bulk of it is excellent - the theoretical part explaining individual rights and natural law, and also the critique of State. It accomplishes what the author intended - providing the reader a fine description of natural law and individual rights. Of course, serious students of political philosophy will want to dig deeper, and Wissler provides plenty of suggestions for further reading, both explicitly and by his quotes and references. The final short sections of the book are opinionated and, as they say, hit and miss, but this should not detract from the main part.